What does the Temperance Movement have to do with children's ware? The 19th century saw a shift from railing against the consumption of alcohol to organizations that promoted either moderation or abstinence. An excellent way to market the dangers of alcohol was through children. 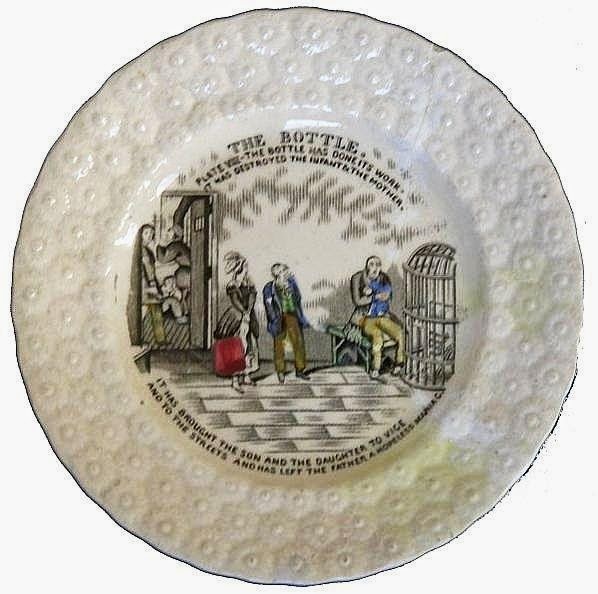 The Bottle/Plate VIII/The bottle has done its work - It has destroyed the infant and the mother. It has brought the son and daughter to vice and to the streets, and has left the father a hopeless maniac. 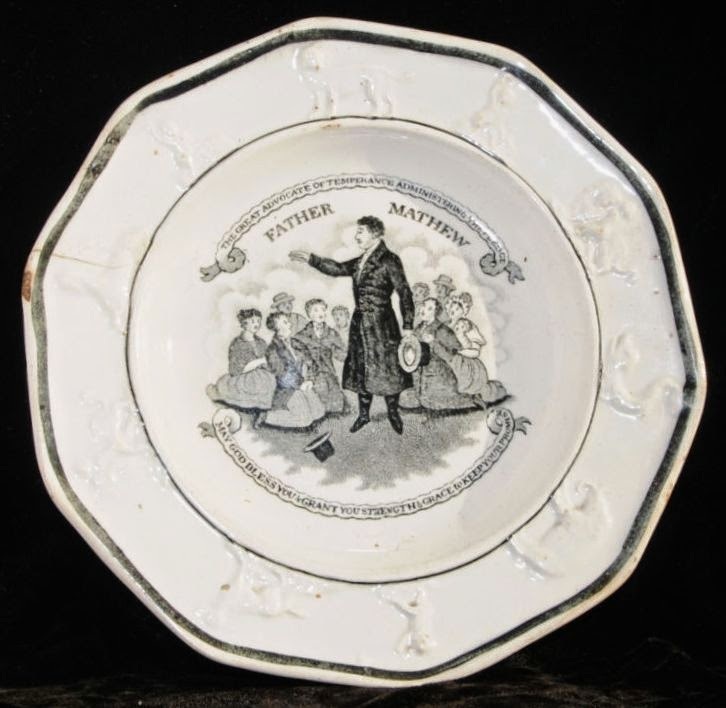 There are many transferware children's patterns that are associated with the Temperance Movement in Britain, but some are quite inappropriate by today's standards. One of the most egregious pattern series is The Bottle. 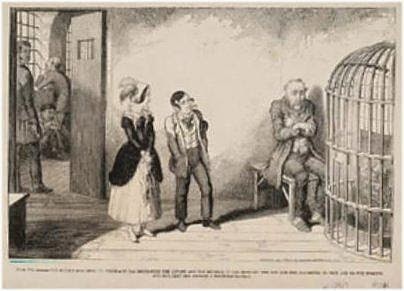 The patterns were copied from a book titled The Bottle with caricatures by George Cruikshank and text by Dr. Charles Mackay. 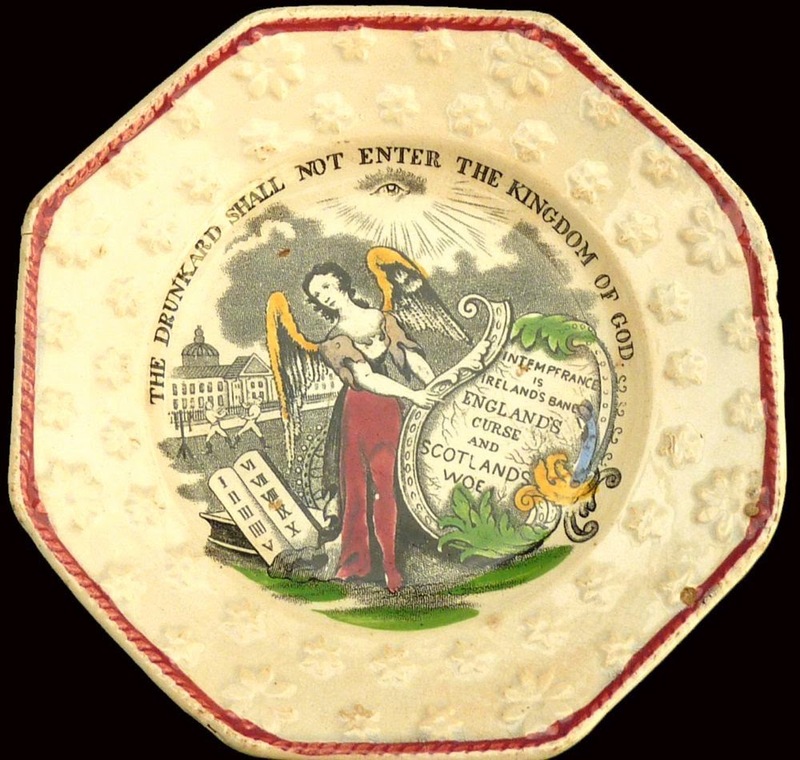 The plates on which the patterns were printed were cheap so that even the poor could afford to give them to their children. There are eight patterns that follow the downfall of a family from the first drink, loss of the home, death of a child, prostitution of the other children, murder of the mother by the father, and the imprisonment and insanity of the father! Although totally melodramatic, The Bottle patterns are the ultimate teaching tool for young minds. An excellent discussion of The Bottle is found in an article from Princeton University. 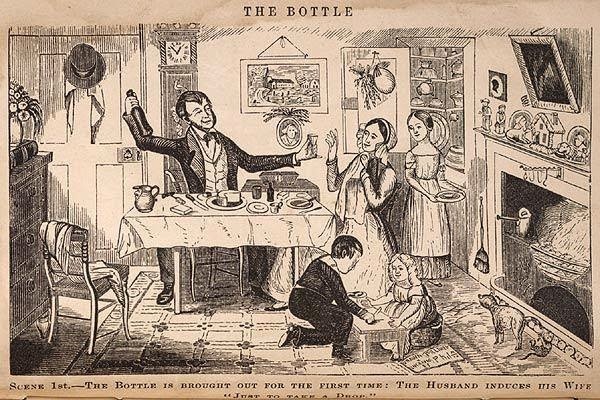 The highlights are: 100,000 copies of The Bottle were sold in the first few days after it was published in 1847; Cruikshank was an alcoholic who decided on becoming a teetotalist; Cruikshank's father died of drink. Other patterns for children also used scare tactics. The Drunkard Shall Not Enter The Kingdom Of God would have been taken more literally in the 19th century than today. The all-seeing Eye of God is at the top of the pattern and the shield bears the words: Intemperance is Ireland's Bane, England's Curse, and Scotland's Woe. The Ten Commandments and the Bible are on the ground. Although seemingly rather humorous, the Caution pattern illustrates the humiliations of drink: Caution/Ah see that Drunkard were (sic) he lies/Old Grandmama quite loudly cries/O yes says Tom pray wait awhile/Another's tumbling o'er the style. The 19th century saw the birth of temperance organizations that preached moderation or abstinence. Some had religious roots such at that founded by the Roman Catholic priest Father Matthew. 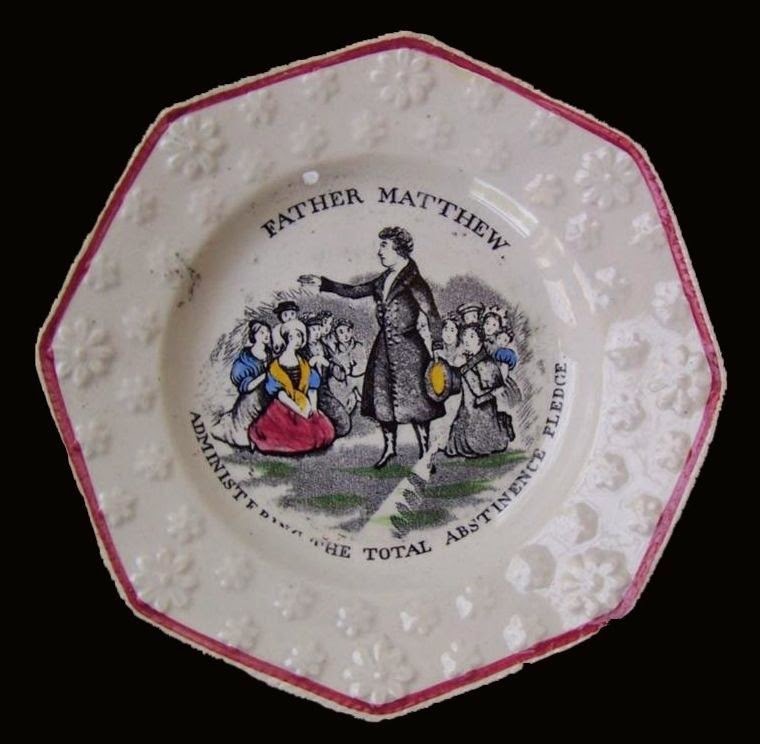 Theobald Mathew or Matthew (1790-1856) was part of the Total Abstinence Society. The movement with which his name is associated began in 1838 and relied on one enduring act of will to keep a person sober for life. It was called simply The Pledge. It could be made by anybody, either with or without an alcohol problem. Children as young as six were recruited. 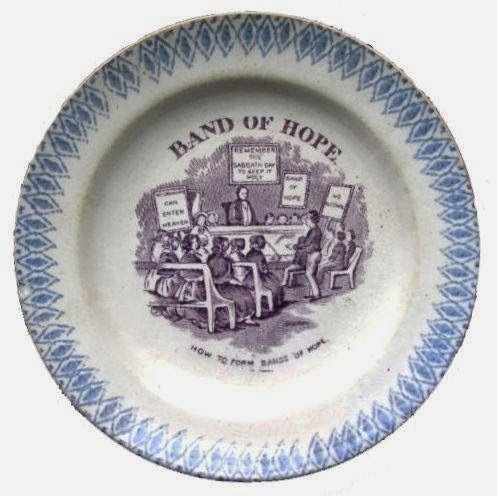 The Band Of Hope, named by an Irish Presbyterian minister's widow, Anne Carlile, was formed at a Leeds Sunday school in 1847 by Jabez Tunnicliff. It became a temperance offshoot of the Sunday School Movement. 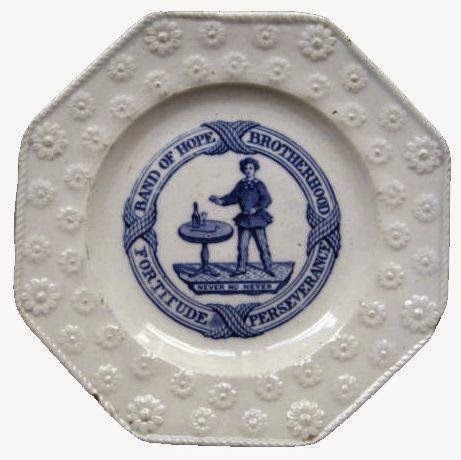 Band Of Hope Brotherhood/Fortitude Perseverance/Never No Never 5.9 inch child's plate/The boy or young man stands beside a table and resists both drink and pipe. He is surrounded by a life preserver. 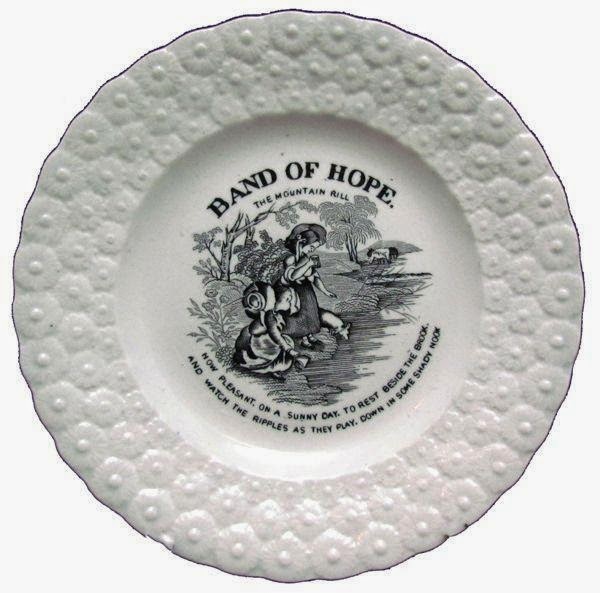 Band Of Hope/The Mountain Rill/How Pleasant On A Sunny Day/To Rest Beside The Brook/And Watch The Ripples As They Play/Down In Some Shady Nook/ 7.75 inch child's plate/Most likely advocating the purity of mountain water and childhood! 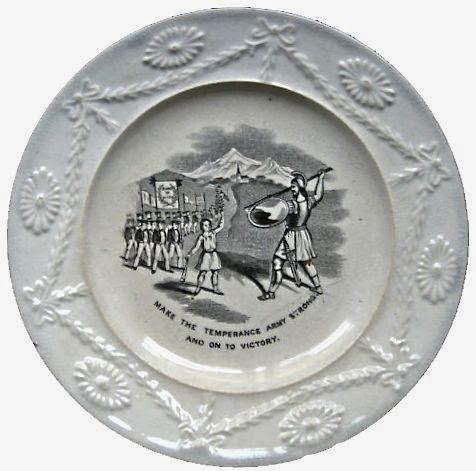 Make The Temperance Army Strong: And On To Victory 7 inch child's plate/The plate has the words Band of Hope on the front banner and Cold Water Army on the back banner. The subject of the plate, the battle between the boy David and the giant Goliath, emphasizes the powerful influence for abstinence that children could have over their elders. The story of David and Goliath empowers children. 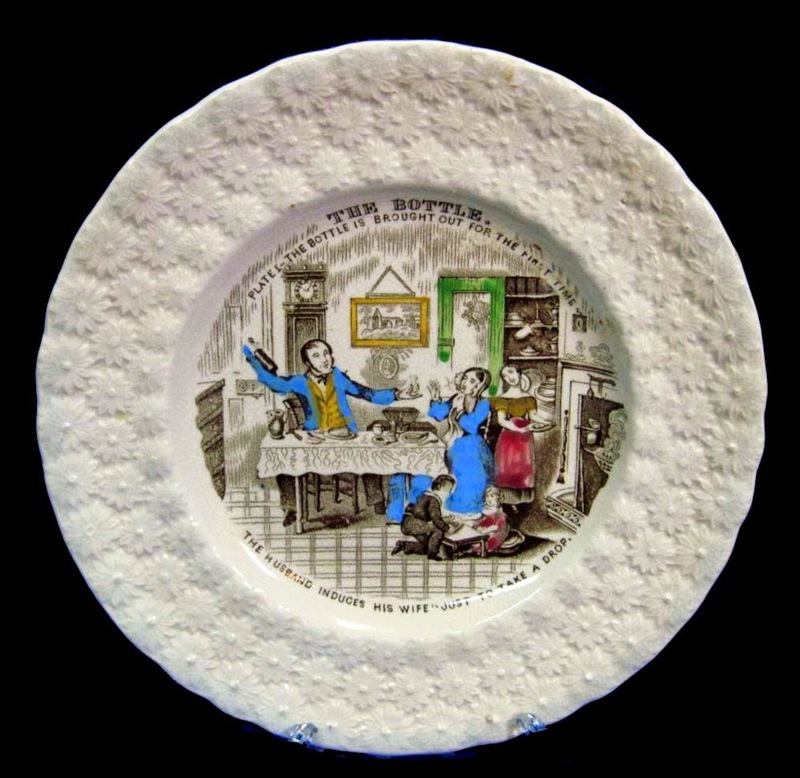 The Transferware Collectors Club Pattern and Source Print Database has dozens of temperance related patterns. I have shown you a few of them. Some of the patterns are historically interesting, some are inappropriate for today's children, and some are both. 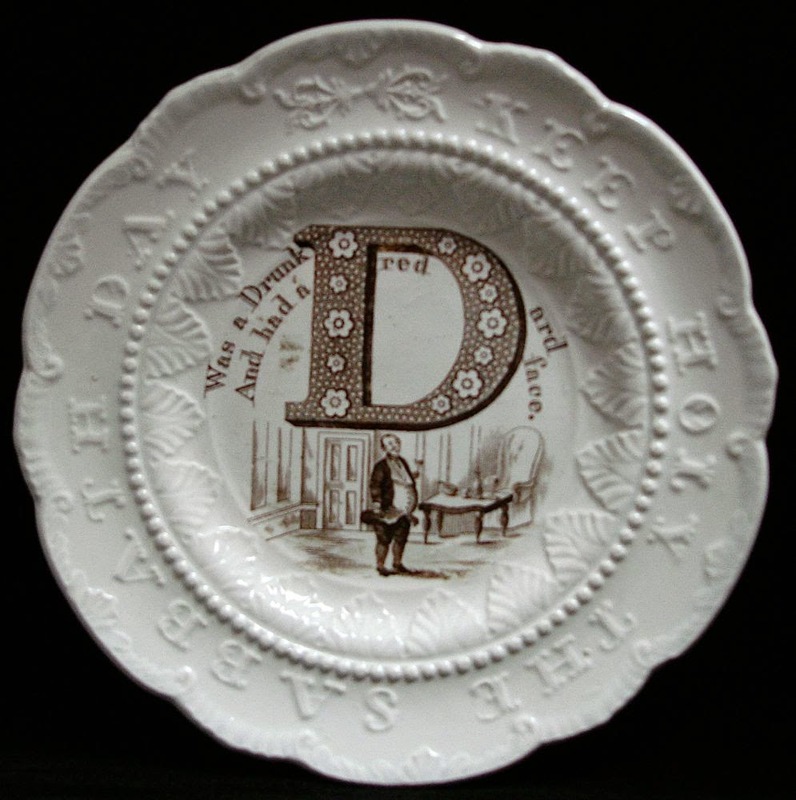 One of my favorite inappropriate patterns is an alphabet plate that uses a drunkard to illustrate and teach the letter D. I would have chosen a dog. 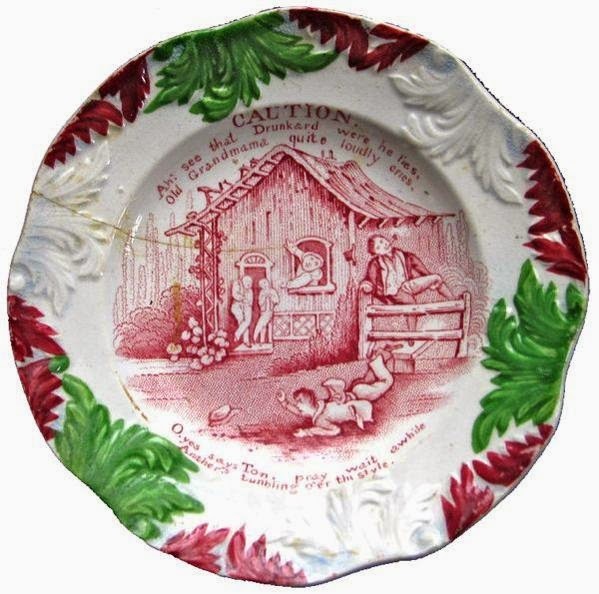 A 7 inch child's plate with a molded border that says Keep Holy the Sabbath Day along with the printed D Was a Drunkard And had a red face on the center/An odd representation for the letter D! I especially like the amusing alphabet plate and, being a teetotaller myself, would rather like to see some modern transfer wares on this theme. A salutary gift for Mr N's next birthday perhaps! I am also am a teetotaller, but mainly because I don't really like the taste of alcohol. Or its dangers. I own the alphabet plate. So amusing. One of my sons writes a wine and spirits blog titled Drink of the Week. We don't bond over alcohol, but luckily he enjoys gardening. And his new baby (Joseph).